After enjoying carrots and hummus for a few days a week, I sometimes lose interest in using hummus as a dip. So, one day I decided to add hummus to freshly cooked rotini and I liked it. The tangy “sauce” was made with 1/2 cup hummus and 3 Tbsp. pasta cooking water for 2 cups of cooked pasta. Then, I took the idea one step further and added hummus to homemade tomato sauce. 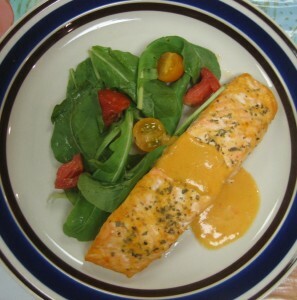 If you’re going to try this recipe, I strongly suggest using homemade tomato sauce because commercial tomato sauces may be too strong/salty to mix with hummus. Combine pasta cooking water, tomato sauce, and hummus in a small bowl. 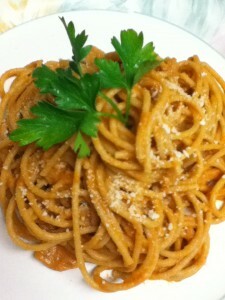 Add to spaghetti and use more pasta water to add more fluidity if needed. Garnish with some grated cheese and parsley. Looking for a new side-salad? 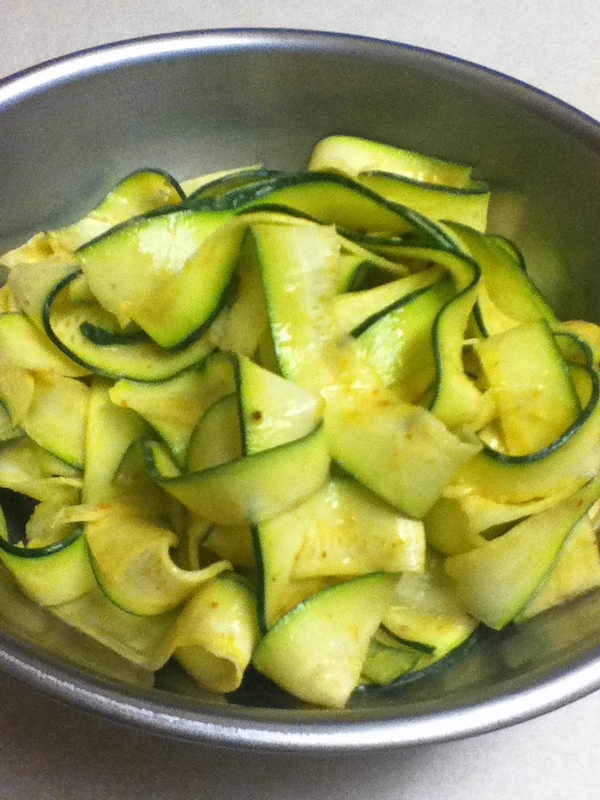 Try this salad of raw zucchini ribbons tossed in an almond butter dressing. If you don’t have almond butter, try peanut butter as a substitute. 1. Add the garlic clove, vinegar, oil, and almond butter to a large bowl and mix together until smooth. Season with salt. 2. Use a peeler to make zucchini ribbons about 1/2 inch wide. 3. 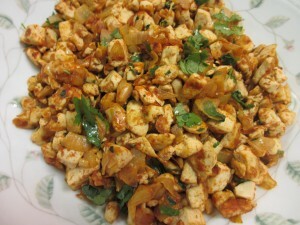 Remove the garlic from the dressing. Add zucchini and toss to coat. A few weeks ago, I was enjoying the warm weather of the Philippines and many of the sweet flavors of the tropics. There I was introduced to a new fruit – Chico. When I first tasted Chico, I was surprised by its slightly granular texture and wasn’t sure that I wanted to continue eating it. 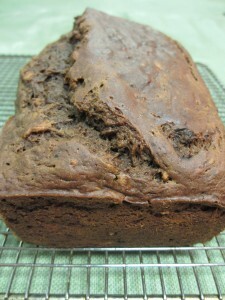 However, I took another bite and delighted in its unique flavor – a combination of ripe pear and brown sugar. I liked it so much that I encouraged my sister to try one! I also had the opportunity to taste fresh Jackfruit for the first time. 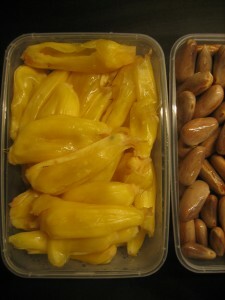 Any time I’ve eaten Jackfruit in New York, I’ve had it coated in syrup from a can or a jar. 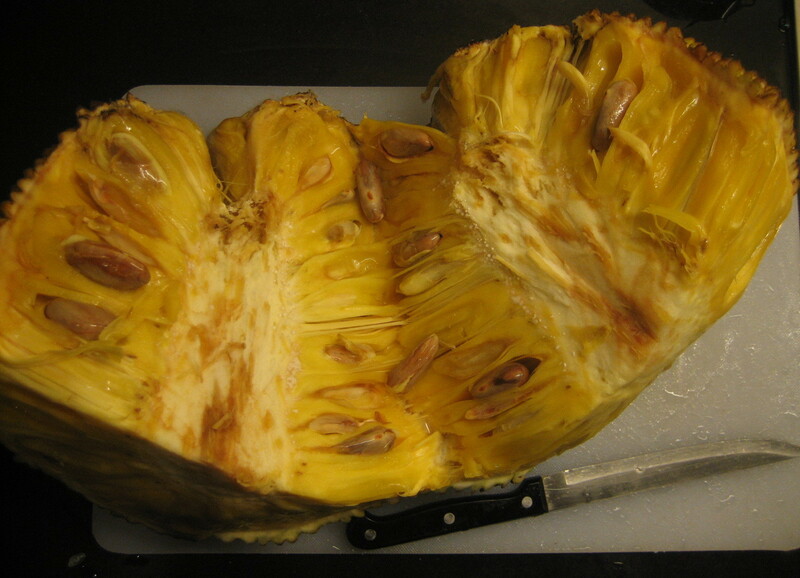 I always liked it, but I knew Jackfruit would even be better fresh. So when I saw the large fruit being sold at a roadside fruit stand, I bought a piece of it. 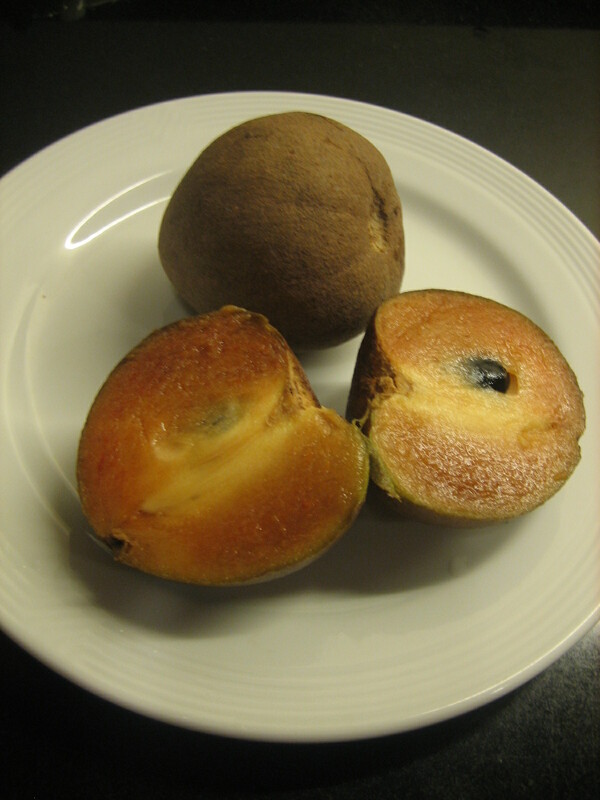 When I got it to the hotel, my mom and my aunt helped to remove the yellow flesh from the seeds. They’re expensive to order on Amazon.com! One day, preferably when it’s not snowing, I’ll hunt for them in Chinatown so that I can taste them again and share them with friends. I’ve been snacking on Larabars for a couple of years now. I like them because they are made with simple, tasty ingredients. 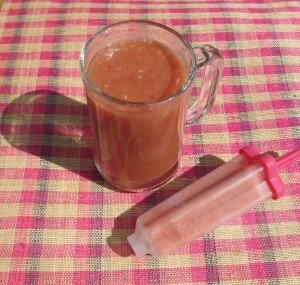 For example, the Apple Pie Larabar is made of dates, almonds, unsweetened apples, walnuts, raisins and cinnamon. I buy the Apple Pie and the Cherry Pie flavors because they have less than 5 % daily value saturated fat. Lately, I’ve discovered Pure Organic’s Chocolate Brownie bar. It’s amazing! The mixture of organic dates, walnuts, agave nectar, almonds, cashews, brown rice protein, and cocoa remind me of the Little Debbie brownies I ate as a young girl. It’s a healthy way to get your chocolate fix. Winter squash, such as pumpkin, sweet dumpling, and buttercup, are bountiful during this time of year. They’re a beautiful way to decorate a home in the fall. They’re also a great way to get beta carotene into your diet to decrease the risk of certain eye diseases, cancers, and cardiovascular disease. Beta carotene is what makes most winter squash flesh orange. This is the first year that I’ve tried buttercup squash. 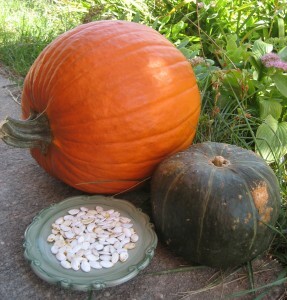 It’s the dark green squash with lighter green stripes next to the pumpkin in the photo below. By the way, I purchased the big pumpkin in the photo for $3.99 at Trader Joe’s. What a deal! While preparing the buttercup squash for dinner, I saved its seeds. They’re similar to pumpkin seeds. 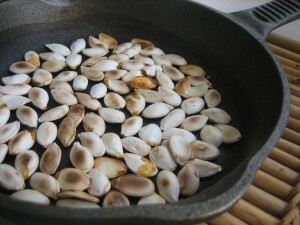 I left them out to dry on my kitchen counter for a couple of days and rubbed them clean to expose their white shells. You can also rinse the seeds first and then dry them. They can be eaten raw or toasted to add protein, iron, potassium, and phosphorus to your diet. Remember, it’s best to eat seeds sparingly because they are high in total fat and calories. 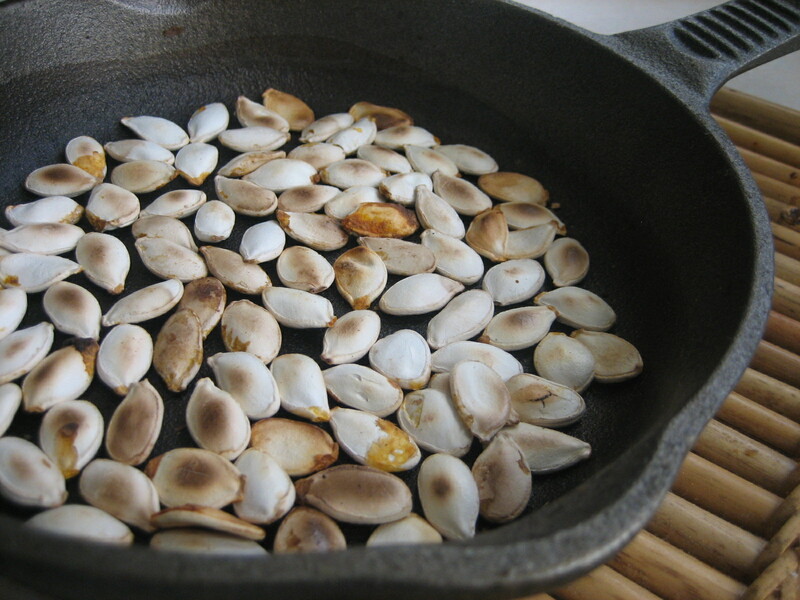 To toast seeds without turning on the oven, place seeds in a single layer in a heavy, ungreased skillet. Then, toast over medium heat for about 5 minutes, shaking the pan and stirring them until they are lightly brown. The seeds are almost ready when you hear them start to “snap, crackle, and pop”. 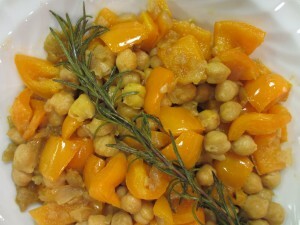 Transfer them immediately to a dish to cool before eating.